I love Bengo the boxer puppy! I’ve adored him since I was a small child and first saw him being drawn by his creator while I was watching the fuzzy screen of a black and white television in the 1950s. An early star of children’s television, Bengo isn’t as well known as his contemporaries such as Muffin the Mule, Bill and Ben and Andy Pandy, yet Bengo collectables have become increasingly sought after by those of us who, as children, followed his simple, hand-drawn adventures. Younger collectors, too, are falling for Bengo’s endearing charm, seeking out models of the friendly puppy and his friends, with some of the more desirable pieces now reaching three figures. William Timym and he was born in Vienna in 1902, where he later became a political cartoonist. He fled from the Nazis in the 1930s, ending up safely in Britain, and continued his artistic career drawing cartoons for several magazines. 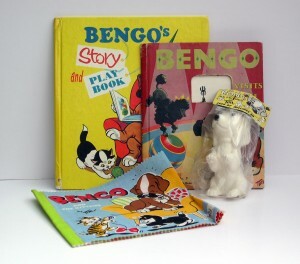 Bengo made his first television appearance in June 1953. In those days, children’s television programmes weren’t as sophisticated as they are today, which was just as well, because children were happy to watch an artist draw pictures while telling a short story – a perfect task for Tim. A feeling of movement was created as the camera panned across the drawings, while strings mounted to a few of the drawings caused mouths to open or paws to wave. After a while, announcer Sylvia Peters took over the speaking role. Bengo had a series of doggy friends, as well as a few kittens, all skilfully drawn by Tim’s thick black pen. 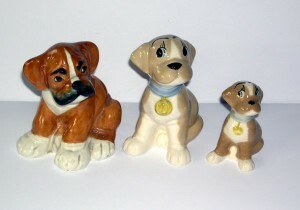 Bengo was so adored that Wade decided to model him with a few of his friends as small porcelain figurines. Today, these ‘’TV Pets’, launched in 1959, are popular with collectors; rarer models exchanging hands for £75 or more, especially if still boxed. They are amongst the most delightful figures ever produced by Wade, slightly bigger than Whimsies, with Bengo being 2 inches high. Bengo is probably the easiest to find, a standing puppy with a friendly face. Fifi the poodle and Simon the dalmation puppy were also popular at the time, and so can usually be bought for around £15. 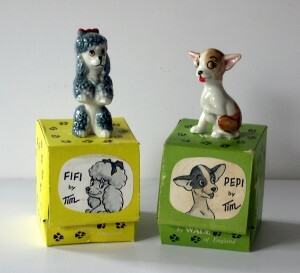 Fifi especially is very common – not only were poodles a 1950s’ icon, but Fifi is modelled in such a way that her limbs and tail are safely tucked in, so she is more robust than some of the others in the set. At the other end of the range, Bruno Junior (Saint Bernard), Droopy (basset hound), Percy (afghan) and Whisky (corgi) are harder to find, certainly boxed. Also in the series were Chee-Chee (pekinese) and Pepi (chihuahua). Clever packaging was used to complement the dogs, with each being sold in a television-shaped box in shades of yellow, green or orange. The box bore the character’s name, as well as a sketch on the ‘screen’ by Tim. 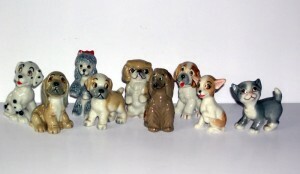 All these doggy figures – as well as Mitzi, the lone kitten in the series – are delightful, and if you can find them still in the original boxes, that’s a bonus, though be prepared to pay at least treble the usual price. My favourite, though, of all the Wade Bengo pieces, is the large Bengo moneybox, a model of the pup seated on a cushion in his basket, and standing 6 inches tall. Excellently modelled, these large moneyboxes cost around £80 or so today. Usually the cushion is pale blue, but a yellow variety is sometimes found, which sells for more. Other companies took up the Bengo theme, notably Melba, whose 5 inch tall chestnut-brown and white Bengo bore a back-stamp reading ‘Bengo by Tim. Copyright Cooper Features, London by H.A.Wain and Sons Ltd., Melba Ware, Stoke-On-Trent.’ Bengo look-a-likes were also issued by Zalpark and Universal, which bore a great similarity to products made by the Szeiler company, and it’s possible that they were created as a joint venture. Pelham Puppets introduced a model of Bengo into their range of string puppets and he continued to be made for many years. This puppet Bengo is easily found today in both the early solid body version and a later hollow body type. The company also produced Bengo glove puppets and a 24 inch high display model as a ‘point of sale’ eye-catcher for use in shops. Additionally, Pelham made other dog puppets designed by William Timyn; Caesar, Ruff, Tuff and Snuff, who weren’t part of the Bengo range but which starred in various cartoons. A company called Sunshine Vinyl Toys brought out a set of squeaky toys based on Bengo and his friends. Presumably intended for infants, these all-in-one moulded rubber toys were about 5 inches high, with a very loud squeak and were packed in polybags. The header cards read ‘Bengo and His Friends by Tim. Seen by Millions on TV’. 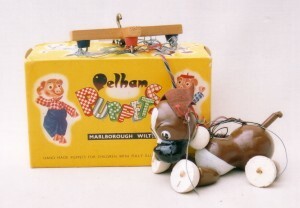 These toys were copyrighted ‘Cooper Features 1958’, and were ‘made in Great Britain’. Extremely difficult to find nowadays, these are something for Bengo collectors to keep an eye out for, but no doubt the majority soon perished after being chewed by infants! 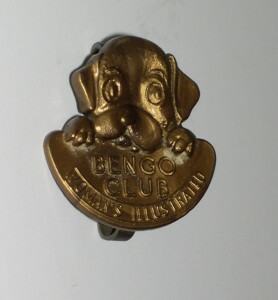 Recently I came across a charming badge featuring the head of Bengo, made from gold-coloured plastic. It was labelled, ‘Bengo Club Woman’s Illustrated’, and I would guess that it dates from the late 1950s/early 1960s. If any one can throw light on this badge – I assume there was a club for children formed within the magazine – I’d be intrigued to hear. Bengo was popular in book form, too, including a colourful series of Rag books made by Dean’s Rag Book Company. These ‘Baby Safe Books’, dating from the 1950s/60s, were advertised as ‘hygienic and washable’ and the brief text was in a hand-written format. He also appeared in one of Purnell’s ‘Twirly Books’ series, which featured books based on favourite television characters of the time. The Bengo story was ‘Bengo Visits the Circus’, a simple adventure which featured a turning dial giving the effect of movement. Other Purnell books included ‘Bengo’s Story and Play Book’ from 1963. 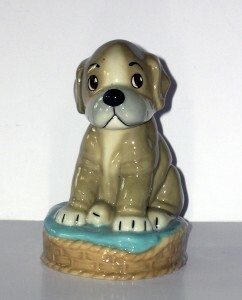 Bengo books add another dimension to a collection of items featuring the charming Boxer puppy. Blue Peter later incorporated Bengo’s adventures into their programme, and he appeared as a strip cartoon in their annuals. Tim was also responsible for ‘Bleep and Booster’, a surrealist-style series of adventures featuring a space-boy and an earthling, and which is still affectionately remembered by legions of fans. Many people didn’t realise that Tim was also an accomplished sculptor, and were pleasantly surprised when he created a memorial bronze head of the Blue Peter dog, Petra, which was placed in the famed Blue Peter gardens. His most famous sculpture is the massive bronze of Guy the gorilla, erected in 1983 at London Zoo, which is invariably being hugged by small children whenever I visit! Tim’s other works include a bust of Sir Francis Chichester which is displayed on the ‘Gypsy Moth’, a sculpture of Sir Malcolm Sergeant which can be seen by the entrance to the Albert Hall; and a bust of Sir Bernard Russell. He also produced delightful paintings, and worked on cartoons for several publications. Bengo seems to be finding more and more fans, even amongst those who are too young to remember his television appearances, and there have been rumours of an animated series being made. William Timyn died in 1990, but through china figurines, puppets, toys and books, his delightful creation of a sweet-faced boxer puppy lives on.